This paper to introduce the types of gold washing machine, according to the method of dispersing mud-containing materials, the gold washing machine can be divided into two categories: one is to break up the mud-containing materials by the dynamic action of the high-pressure water flow, such as washing chute, hydraulic washing deposit and various flat screens; or In the low-pressure water flow, the mud-containing materials are broken by the friction between the nuggets and the nuggets and the mechanical surface, such as a cylinder trommel scrubber, and the like. The second is completely done by the mechanical action of the equipment, such as spiral washing machines, spiral classifiers. 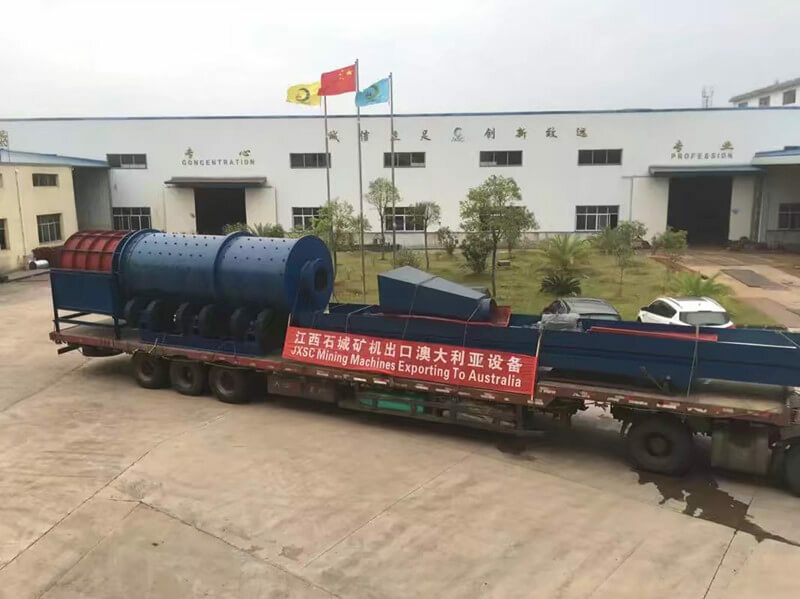 In China, sluice box and trommel scrubbers are commonly used in the processing of sand mines and gold mining vessels. 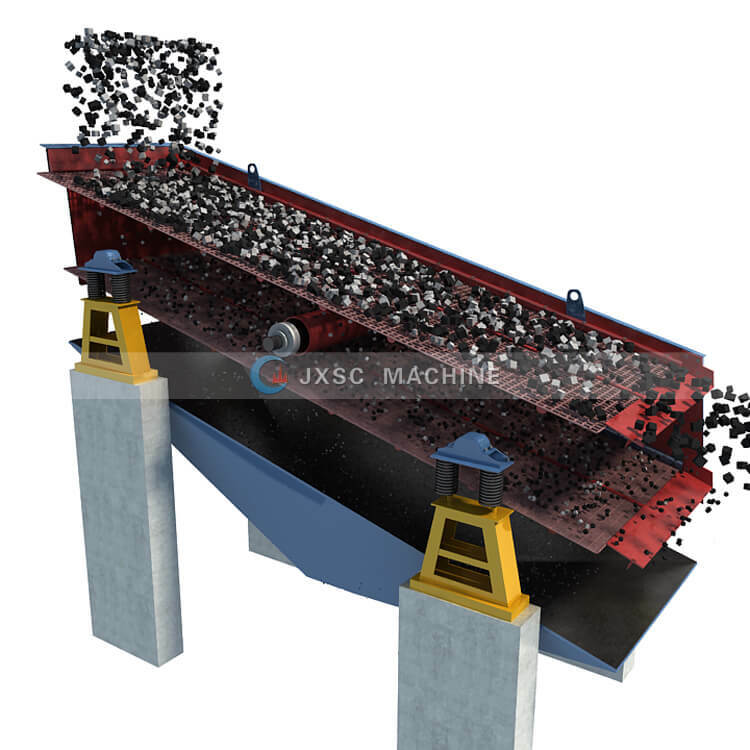 In the washing operation of non-ferrous metal ore, a double-layer vibrating screen (or two single-layer vibrating screens arranged continuously) plus a spiral classifier is commonly used as washing equipment. In the washing of diamond ore, a trommel scrubber washer, a spiral washer and a scrubbing machine with a head screen are often used. In some ferrous metal beneficiation plants in the south, vibrating screens, cylindrical washing machines and trough washing machines are commonly used. In the washing of apatite ore, various vibrating screens and trough washing machines are also used. 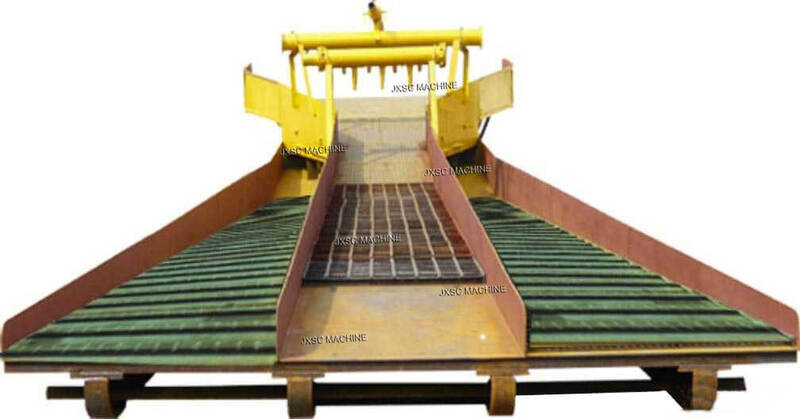 The various vibrating screens used for washing are all shaped sieves and high-pressure water washing. Most of the cylinder washing machines are designed and manufactured according to actual needs. Most of the trough washers and scrubbers use the Soviet standard and have a single specification. China’s washing equipment is still in the stage of development. The ore washing sluice box is suitable for easy to wash and medium washable ores. In China, it is mostly used for the washing of sand mines and gold ore. In actual production, it is often used in combination with a trommel scrubber or a vibrating washing screen. Gold sluice machine for sale. The difference in structure from the ordinary washing chute is that a grill is provided at the bottom of the entire sluice chute length, and a fixed strip screen is provided at the end of the chute. A nozzle is provided at the head of the sluice (or the upper part of the entire sluice), and when the material moves along the chute in the water stream which is emitted from the nozzle at a high speed, the coarse nugget slides and turns, so that the slime is washed away in the jet. In actual production, in order to strengthen the disintegration of clay-like impurities, artificial antimony ore is often used, and high-pressure water is fed into the mine with a water gun in the head of the sluice box. The fine sand and clay are separated from the coarse material by the grid at the bottom of the chute and the fixed strip at the end. The size of the grid pores and the sieve mesh are determined by the process conditions, usually 10-15 mm. The washing efficiency is related to the length and angle of the gold chute box. The unit water consumption depends on the washability of the material. Usually, the water consumption of 1 m3 material is 10~30 m3. The trommel scrubber(also known as the washing trommel screen) is actually an elongated cylinder screen. A tube in which a nozzle is attached only in a cylindrical sieve, water is ejected from the nozzle at a pressure of (1.96 to 3.92) x 106 Pa, and the clay-containing ore moving along the cylindrical sieve is washed. The rotary drum scrubber used for sieving is only suitable for the treatment of easily washed sand and gravel materials containing a small amount of clay impurities, while the cylindrical washing machine has a strong mechanical and hydraulic action, and is suitable for processing medium sizes of 200 to 300 mm. Washable and hard to wash ore. It is mainly used in the washing process of sandstone materials in the construction industry, some quartz sand mines and gold mining vessels, and the washing process of brown iron ore and individual non-ferrous metal ore. The structure of the rotary trommel screen is relatively simple. There are two non-porous cylinders at the feeding and discharging ends, which are supported on the idler and the middle part is the cylinder screen. When the processing degree is not large, a single-layer cylinder sieve is sufficient. If the blockiness is large, two or more layers of the cylinder screen may be provided, and the sieve hole size is sequentially decreased from the inside to the outside. Gold trommel scrubbers are usually installed at an angle to facilitate the discharge of materials, and the inclination is generally less than 8°. In order to avoid clogging of the screen holes, the washing cylinder screen is preferably formed into a conical shape, and a large diameter head is directed toward the discharge end. For hard-to-wash ore, a chain and a ring-shaped molar are placed on the inner wall of the cylindrical sieve. The production capacity and water consumption of the cylinder washing machine depend on the washability of the ore. In terms of kinematics, the working condition of the cylinder gold washing machine is the same as that of the cylinder screen, so it can be processed according to the unit time per square meter of sieve surface. Design and manufacture a suitable cylinder washing machine with actual data such as water consumption. The technical data for the cylinder washers listed in Table 2 are for reference only. The spiral washer is available in three types: tilted, horizontal and combined. Tilt-tank washers are the most common, horizontal and combined because of the addition of auxiliary devices such as feedstock and dewatering products, which have not been widely used. In terms of the working mechanism and application range for the dispersing and conveying of materials, the inclined spiral washing machine is further divided into two types: a spiral (or a spiral) and a blade. The former is similar to a spiral classifier for the treatment of easily washable and medium washable materials with a particle size of 0 to 10 mm, and the latter for the treatment of medium washable and difficult to wash materials up to 100 mm. The inclined blade paddle type gold washing machine is composed of the number of blade paddles, the shape and size of the blade paddle, the installation angle of the blade paddle, the overflow weir, the transmission device, the arrangement of the flushing water, and the ability to remove the slime. A variety of different models and specifications. However, in terms of mechanical structure, they are all the same, except that the blade shaft and the groove are different in size. The inclined blade paddle type gold washing machine consists of a groove body, two face-to-face rotating hollow shafts, a lower bearing, a packing water seal, a transmission device, a grit chamber and an overflow tank. In composition, the blade paddles are made of high manganese steel and are interleaved on the hollow shaft. The apex of the blade paddle constitutes a helix, and the mounting angle of the blade paddle (usually 65°) faces the lower side of the shaft. The shaft rotates the blade to propel the ore to move toward the discharge end. Feedstock and water are fed into the gold washing machine from the lower part of the tank, and about 2/3 of the length of the tank is filled with pulp. The mud and the surface of the ore with the mineral mud adhered to it by means of the shovel, scrubbing and flushing of the appropriate amount of high-pressure water (water pressure of 0.1~0.2 kPa) from the upper end of the tank, so that the slime is broken and Separated from the ore particles to achieve the purpose of washing. The slurry and the coarse-grained material move in the opposite direction, and the washed fine mud is discharged from the overflow tank at the lower end of the tank body, and the coarse-grained material is pushed up from the blade paddle to the grit chamber for discharge. The inclination of the tank is generally 5 ° ~ 12 °. In China, inclined spiral washing machines have been widely used in the washing of diamond, residual slope iron ore and manganese ore, limonite and sand tin. The Changsha Black Metallurgical Mine Design and Research Institute has designed a sloping tank type washing machine for the washing of difficult-to-wash limestone, dolomite and manganese ore in the south. The production practice shows that the inclined tank type gold washing machine is particularly effective for the disintegration of the viscous mud mass due to the scrubbing and squeezing ability during the washing process. However, due to the limitation of the maximum particle size of the washed ore, it is most suitable for the treatment of refractory ore containing a large amount of ore and containing a lot of mud. It is not suitable for the treatment of brittle materials, which will cause the serious muddy phenomenon. 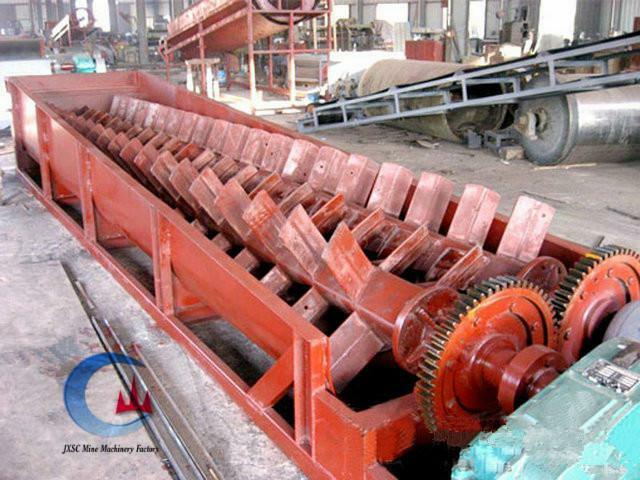 Vibrating screens and vibrating sieve machine are used for easy-washed or shattered ore, and the slime and coarse ore can be separated by a flat vibrating screen or a vibrating washing screen of a conventional structure equipped with a water spray device. vibrating screen as a gold washing machine always combines with stone crushers to process. In order to uniformly spray the water flow along the width of the sieve, a specially shaped nozzle centerline may be used, and the inclination angle between the surface of the material on the screen should be 100° to 110°, and the distance from the nozzle to the material surface is preferably 300 mm. The nozzle can be made in the form of a cyclone (water enters from the tangential direction), or can be made into a vortex bushing (water entering from the center), the vortex bushing is conical, and the inner wall is a spiral groove. After the water is fed from above, the spiral grooves are created to create a relatively uniform jet of the swirl. The use of these two nozzles can reduce the amount of water used and improve the efficiency of washing. When the water pressure is 0.15~0.2 kPa, the washing water consumption is about 1~1.5 m3/ton. The washing efficiency is 75~85%. 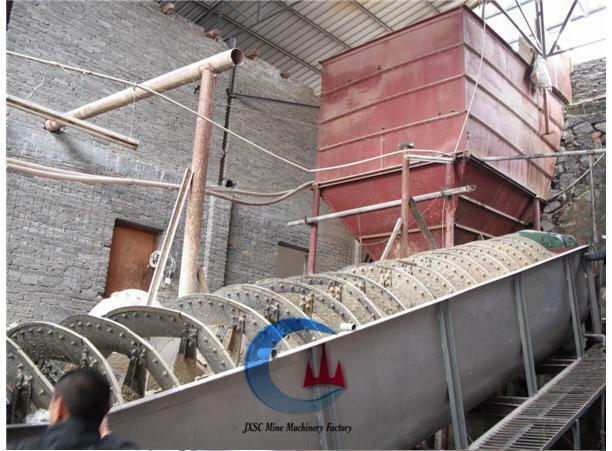 JXSC provide a full of the gold washing machine, applied in different mineral mining plants, contact us to know the list of gold mining machine price.